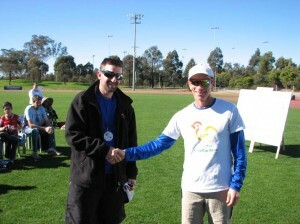 Sri Chinmoy Sydney 24 hour championships 2012, Saturday June 23 – Sunday June 24 @ Blacktown Sportspark. This was my first ultra marathon. 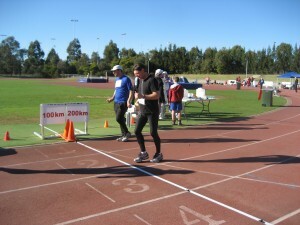 In fact, it was to my first race over any distance since running the 4oom in Year 8 at the school athletics carnival. I went in feeling confident that I would finish and that I’d get above the minimum target I’d set for myself of 120km. I was still dreaming of 100 miles, but not so confident. 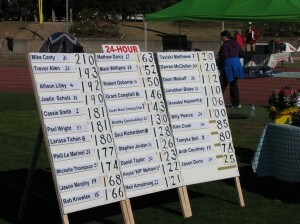 I knew from training that I could keep up the required pace for about 6-7 hours before it really started to hurt. That was the longest I’d ever trained on a track or road at pace. All my longer walks had been on bush trails, which are far more forgiving on the feet and legs due to the softer and infinitely varied surface. The track was pretty quiet when I arrived trackside along with my last-minute crew, Anne. 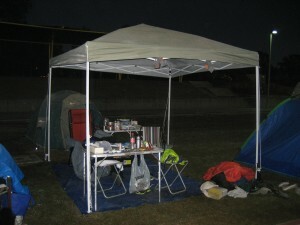 Things soon got busy and a little tent city popped up around us as the other runners and their crews arrived. Lots of them had their whole family along and looked ready to make a weekend of it. 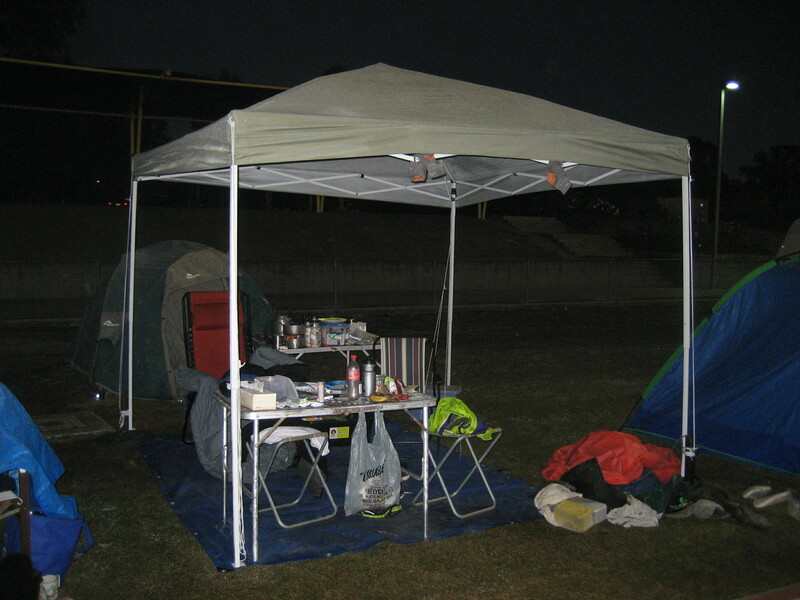 The tent right next to us belonged to a contingent of three other walkers crewed and coached for the race by Tim Erickson. Tim is an icon of Australian Racewalking, being heavily involved in racewalking administration in Voctoria, leading the Australian Centurion’s club, race director of the Coburg 25 hour race, and a terrific walker himself. His team included Michelle Thompson, one of Australia’s strongest walkers, Steve Jordan a veteran of 24 hour races with a 157km PB, and Kim Cook a well-known ultra runner-turned-walker there for his second attempt at the 100 mile walk. It was pretty inspiring having so much experience so close at hand: people who had only been names and photos to me before. Now I’d be able to see them at close quarters and hopefully learn as much as I could from watching them in action. There was a long wait before the race started at 10:00am. 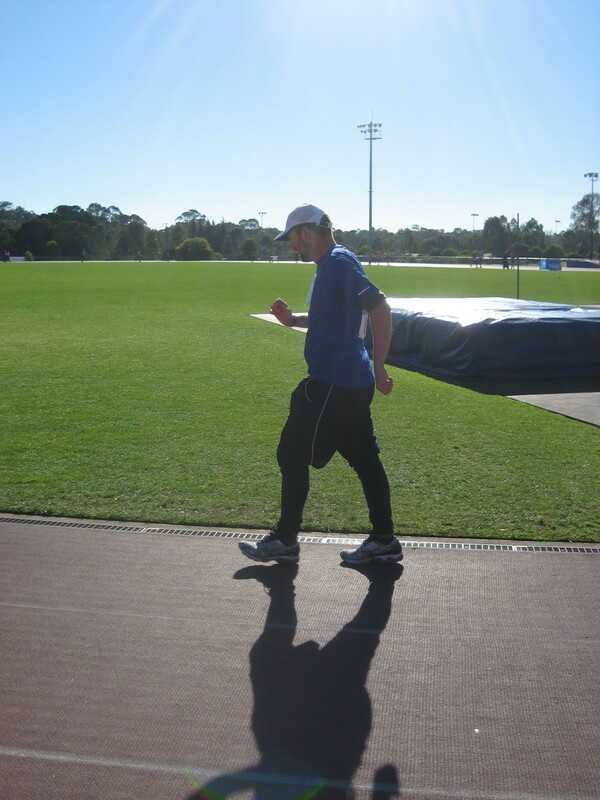 And yet, when it was time to start i still felt rushed, and didn’t manage to get through my whole warm-up routine. I was determined not to start faster than my target pace of around 3:20 per lap. It was a bit alarming to see everyone else rushing off into the distance, including all the other walkers. There were 35 in the race, including six walkers. It wasn’t long before I was being lapped by most of the runners and by Michelle. In fact, Michelle lapped me so many times during the race that I soon learned to recognise the sound of her quick, slightly shuffling cadence coming up behind me. It didn’t take long for me to loose all track of how many laps I’d done. I kept timing myself for the first few hours to make sure I was on pace, and used my metronome to check my cadence was at the rate I’d figured out in training (146 steps/minute). For the first few hours I was spot on pace or slightly ahead. But gradually, things began to slip and after about 3 and a half hours I tried walking a very slow lap as a rest. It hardly helped. After almost 4 hours, just before the first change of direction, I took a break of about 5 minutes. This was ok, because I had planned a short stop once every four hours. The problem was that I had slowed right down before stopping and was now way behind schedule, already! The other problem was that it took about three laps to get moving again. During my break, I took a caffeine tablet and a Neurofen to reduce swelling. Once these kicked in I was able to put in another fast spell, taking back a lap from Steve Jordan and clocking up some useful K’s. And this is how it went for the whole race: fast, energetic spell followed by a really hard and much slower period. During the day the 6-Hour race started and finished, the runners seeming to sprint by. Later in the evening the 12-Hour racers came on. But otherwise it was just a case of steadily moving around and around and around the track. Music helped a bit at times. AC/DC, Count Basie, Slade and Iron Maiden all made an appearance. I kept my headphones on until the end of the race even after i gave up on music because they kept my ears warm. As the night wore on it got cold. Everyone on the track started putting on more and more layers of clothes. 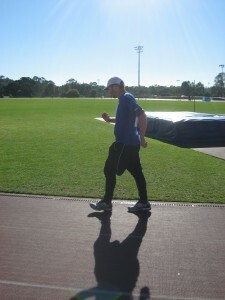 All except for barefoot Rob Knowles from QLD who was running barefoot and going for a couple of barefoot world records. He ran without shoes or socks (obviously), in just shorts and a light jumper and an akubra hat for most of the night. I put on some extra layers, but probably not enough. I didn’t feel very cold as I moved, but I think I was wasting a lot of energy in keeping warm. I wasn’t sweating much at all and had to pee often, so I think I should have dressed warmer. Apparently it got down to -3 at the track. I didn’t know that until after the event. There was a havey frost on the grass around the track and even on runner’s heads and backs. As the race wore on it was good to be able to chat briefly with some of the other walkers and slower runners. 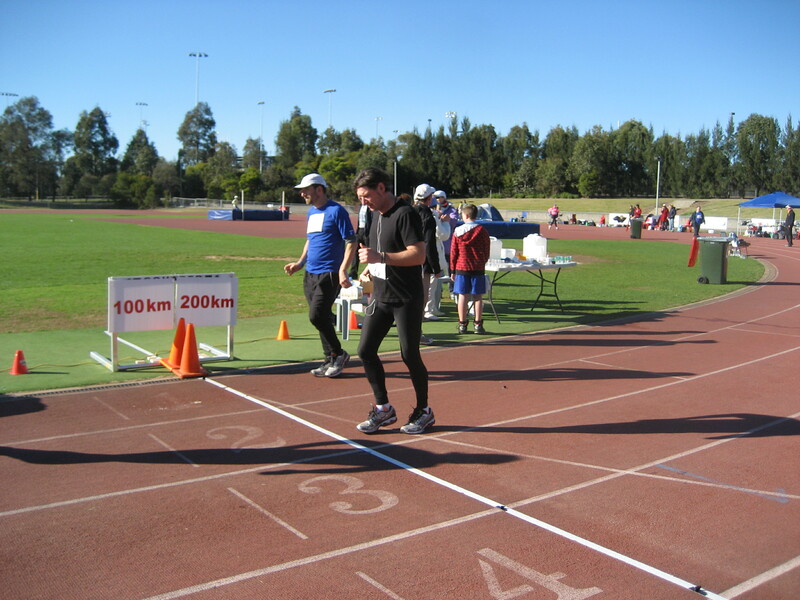 Steve Jordan, Robert Boyce and Kip Melham were particularly encouraging, but everyone on the track was friendly and the atmosphere and comeraderie were great throughout. I’ve often heard people say that about ultra races, and this one was no exception. It was a real shame that Kim Cook had to pull out injured fairly early on, because he was looking seriously good. Steve Jordan also had a really rough patch and had to give up on his 100 mile goal. He’d also been walking at a great pace, much better than me. He did come back to the track after a long break and finished well. As we got withing 45 minutes to go I started to really push hard and got back to a sub 3:20 pace until the end. I finished with 128.8 km, 18th place overall, 10th in my age group and the second highest total among the walkers. Above my 120km target, but nowhere near 100 miles! Lots of work still to do if I want to get that. I added motivation for myself by asking people to sponsor me for every km I walked in excess of 120 km. Funds raised were for the Sydney Youth Jazz Orchestra. This certainly helped me at the end. I think that if I had made it 130km, I could have reached that target. If I have a crew, involve them far more directly in monitoring my nutrition and hydration schedule plus splits, pace and so on. Also managing what I wear and how long my breaks are. Not letting me stop for more than a moment, or even not letting me sit down at all. Simplify my training so that I am doing more long walks at much closer to race distance and pace. Increase my weekly mileage. I shouldn’t try to tell myself that 20km is a “long walk”, because it isn’t! Increase the speed that I can maintain for 4 hours non-stop. Set far more very short term goals for during the race. Early on I had quite widely spaced targets, but at the end my targets were very close together: 120km, 121km, 122km, 125km, and so on. Three or so laps at a time seemed to work well. Finished the race with no blisters, no chafing and only moderate bruising to the feet. Sore calf muscles and quads, but not too bad and only for a couple of days. Most enduring pain post-event is in my toes and the balls of each foot. All in all, it was a great experience and unlike anything else I have done. From my background in bushwalking where one of the worst things imaginable is the dreaded “trail bash” or the still worse “road bash” (walking along a fire trail or road), 24 hours on an athletics track should have been anathema. And yet, it was compelling and addicitve. Brutal and painful, but compelling. I can’t wait to get back into hard training for the next one! Thanks to Anne Perry for crewing for me, at very short notice. I really appreciated the help and company. Hi, is this an email, or a comment space? I have an ’email’ for you. it is a comment space. Email nsbjazz@hotmail.com. SR.